14 to 16 waking hours. What in the end is one day? Each one day slogging together to produce 7 one days that we call now a week. 365 one days slogged together to produce what we call a year. One revolution around sol. Well almost, still have to turn .25 one day. Then it is one full revolution around sol. In one day the world can change. I wonder sometimes. Sitting in traffic or here writing this blog if the day that past was/is/will be as good as the day to come or worse. Each day of a week sometimes blurring into unforgettable pudding or possibly breakfast oatmeal congealed in a bowl. Will today be better? Is today the day? Or is today like all the other yesterday’s just another tick in a leather belt, another fallen gunperson? The day a slower draw than yesterday or a fast draw than tomorrow until there is only memories of what was. There in a question in and of itself was yesterday the better day? I ask myself that often. Do all your yesterday’s equal one tomorrow? or 1000? What in a life of days stretched behind you is the point of known return? Or is it rather that it is the days ahead that we should turn to? We should close the door on yesterday and see only tomorrow? 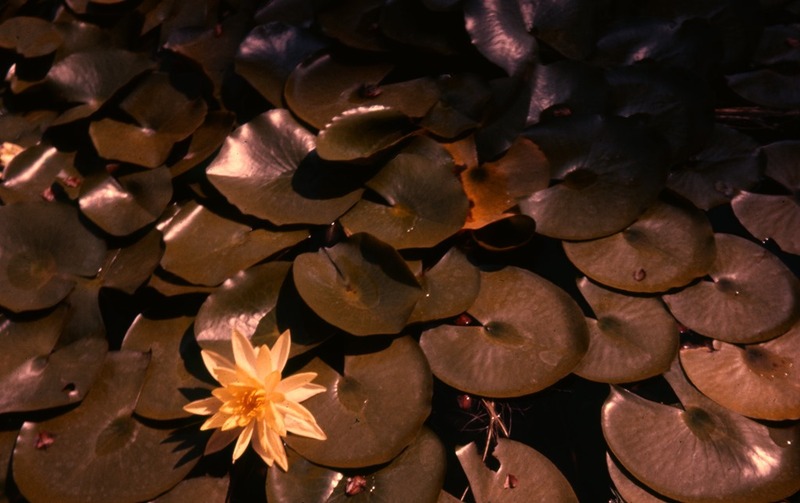 Today is my last posting of slides/scans for awhile. I am taking a break from memory lane. I will be back to my regular blog features on this forum starting tomorrow. At some point in the future I will resume the picture blogs. 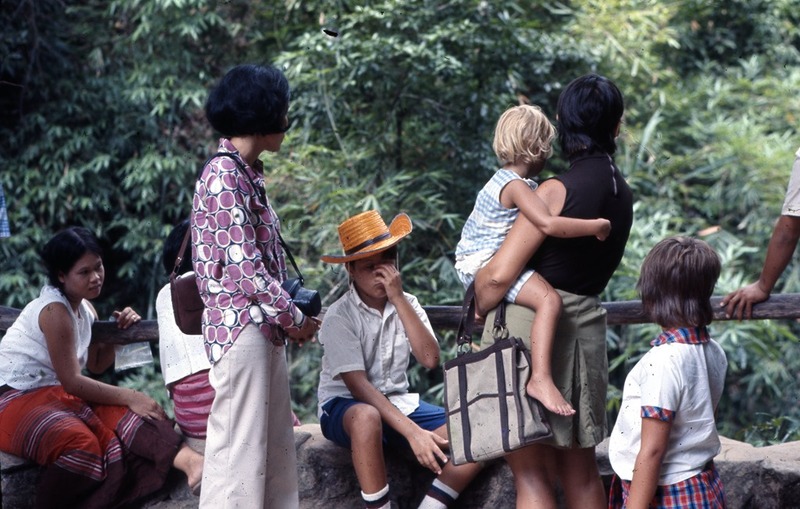 We are at 4300 of 9200 slides and now 0 of 4800 pictures scanned. The royal palace in Bangkok. Yes it does have a moat. Plus guards. The King of Thailand actually holds a patent as an engineer. He built a system to solve the problem of static water. In the tropics static water or stagnant water is a huge problem quickly due to the heat. The King invented a system that keeps static water (not naturally moving) mooing. He in the 1970’s was the only monarch in the world with a patent. He also had a moat. That by the way is cool, too. When we lived in Bangkok there was a coup de ta where the military took over the government. It doesn’t happen very often but it did while we were there. For a couple of days there was a lot of tension and then everyone went back to living. Sometimes the world of the government doesn’t impact the world of people much. Sometimes it does but in that case it didn’t very much. There are a number of pictures of Thai movie posters in the Thailand tray. Dad was intrigued by the vast difference between the ones in the US and the one’s in Thailand. First of all there were many more in Bangkok. Second of all they were big and everywhere. Some of the US rules didn’t apply which made them interesting. Its been nearly 300 years since the puritans were banished to the wilderness of the colonies. But the puritan spirits is still alive and well! The posters were always interesting for an 11 year old. 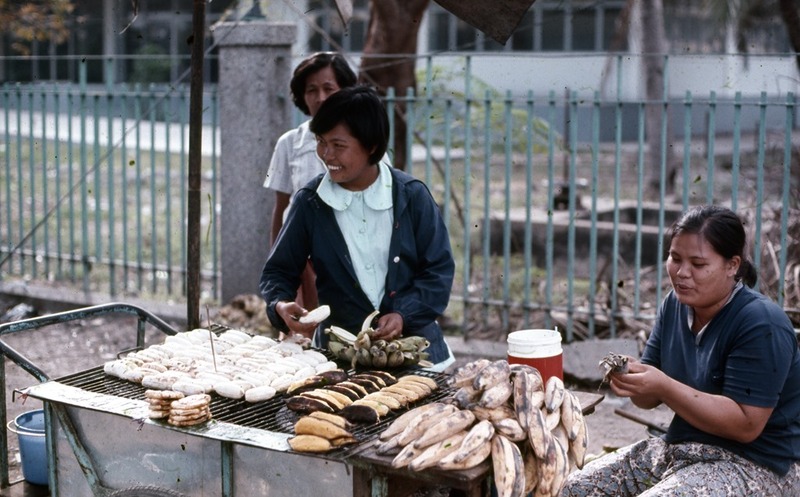 From Bangkok to New York City the best food is sold by the street vendors. Sure there is a risk of sanitary issues but in the end it is the best food. You learn more about a culture when you immerse yourself in that culture. As I said above this is my last picture blog for awhile. I need to take a break and move back to my traditional blog components. I hope everyone has enjoyed the many wonderful images my grandfather and father took along with the couple of cool pictures I took or my daughters/sons took as well. Somewhere in Thailand. The disgruntled looking young man in the cowboy hat is me. I suspect as I have done dad took this picture to use later with first dates and such like that there. See, he was always melancholy. Mom is holding Barb and Lynne is standing by mom. The where is lost but you get the idea. Thailand is hot compared to Indiana. It took us a couple of months to get to used to being hot. The thing I never lost from living in Bangkok is now when its hot outside I sweat. I sweat a lot in fact. An adaptation my body made in Thailand that never really went away. This picture is a continuation of the first picture from yesterday. This is all of us on the boat. We were heading out to the islands in the distance for swimming around the coral reef and a wonderful picnic. I didn’t much like eating fish before living in Thailand. I grew to love it there. Of course coming back to Indiana I stopped liking fish for a long time. There is something about fish that hasn’t sat in ice for 2 or 3 days that just tastes better at least it does to my pallet. I’ve found since moving to the East Coast that the fish does taste better, fresher. This is a slightly wider picture of the same as the first one. There was something down there to look at that is for sure. Dad is in this one in his Thai Dragon shirt. Both of us had Thai Dragon shirts that we loved. Mine was red and Dad’s was blue. Later on a trip to Thailand he brought back another Dragon shirt for me. Like I said we loved those shirts. Not sure where in Thailand this is. But that is the whole Clan. Starting on the left was my mother with Barb in her arms. Lynne next to mom and then it was me. Last was Dad facing the camera and smiling. 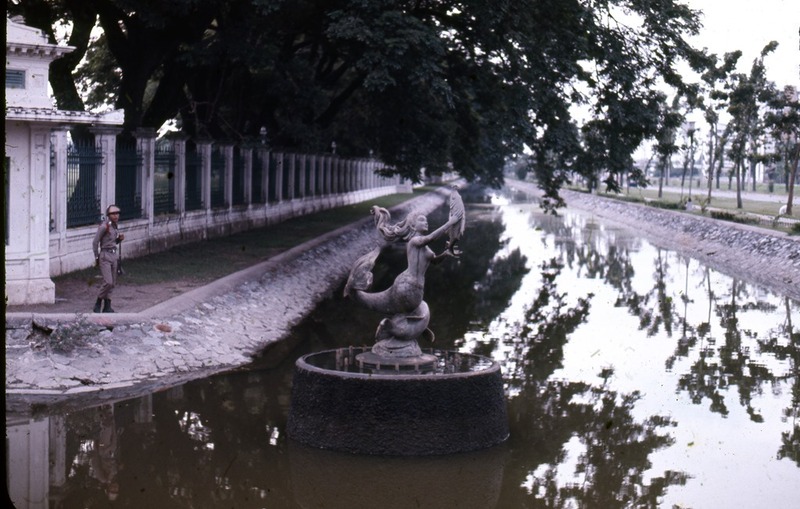 Laddawan Kanhasuwan. She is one of my favorite people on the planet earth. Dad called her Pi Laddawan, Pi means older sister in Thai. I am sure there is an inside joke with that but I wasn’t privy to it. She was after all younger than my father (by a few month or a year maybe). She always listened to Lynne and I about our school days, what we were interested in and what we were thinking about. She used to tease my dad and knowing his personality that was good for him. He liked it when people teased him and engaged. It opened the door for him to tease them. Now that I think about it I suspect that is in the end where Pi came form. 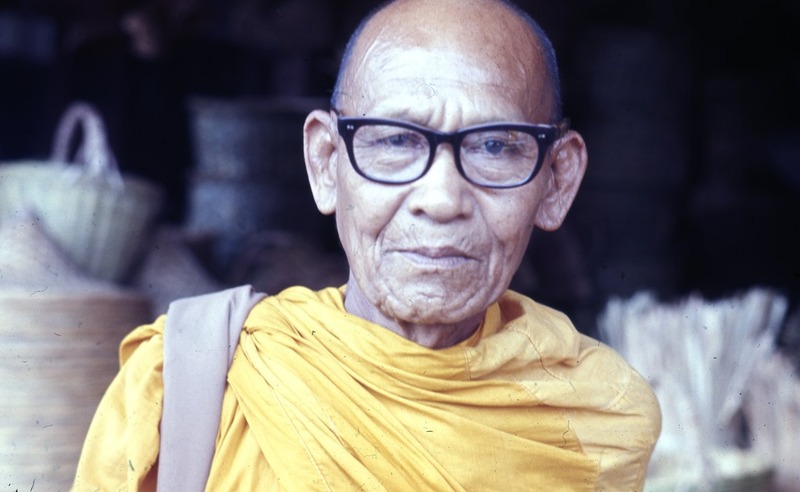 Laddawan was one of the people that made our living in Thailand better. She was always there to help (she also visited us in the United States). She is one of the kindest people in the world. 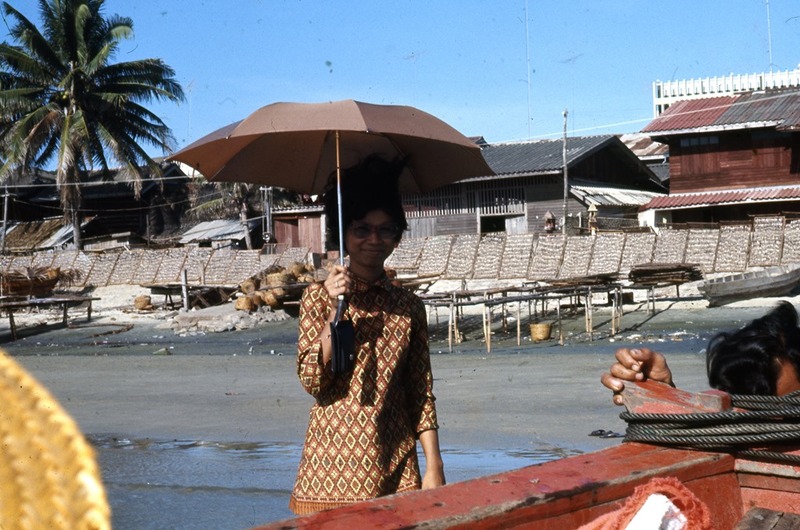 We’ve moved onto som e of Dad’s 1972 pictures of Thailand there are many in the upcoming days that are simply amazing. This picture was as we went out to have a picnic on an island. Laddawan didn’t go on boats so she stayed behind. The umbrella was so that she wasn’t exposed to the sun. A Buddhist monk out and about in Thailand. There are many wonderful pictures of Thailand. It was game changing experience not only for my parents but also for my sisters and I. For a time we were the minority. We were the ones who were different. It changes your attitude about the world aroun d you. I find great personal peace in the teachings of Buddha. I find even more peace in the long past eyes of this monk. 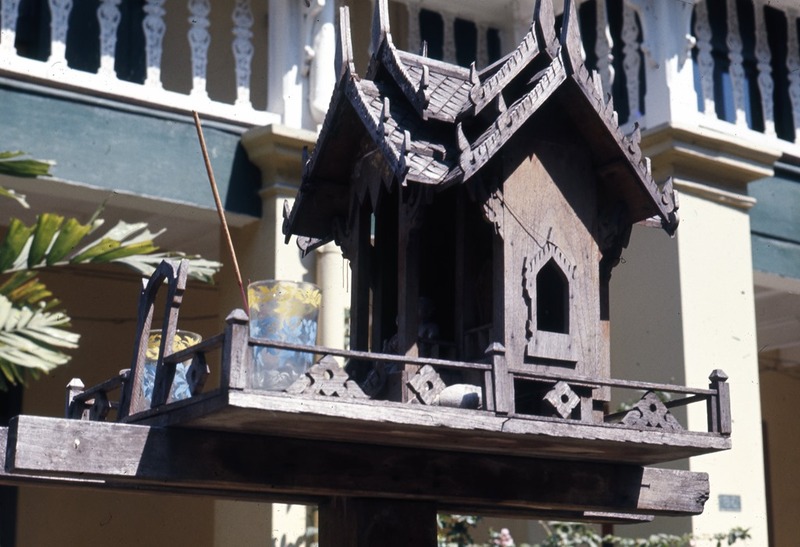 In Thailand people had spirit houses that were adorned and protected. These spirit houses were in front of the house so that you passed it on your way in to see whoever lived there. Some of them were incredibly intricate and told a story of the home. Others were utilitarian but used every day to share with eh sprits. Ride with me into the setting sun and adventure we will have. Beyond the hill beyond the road to the land that time forgot. He and I would ride along the roads of Wisconsin playing car games and talking. I learned so much those summers with Grandpa and Grandma Johnston. Its only fitting that a picture by my Grandfather Andersen triggered those memories and wandering Wisconsin. This is the house Grandpa Andersen and Grandma Andersen moved to in Sturtevant Wisconsin. I remember visiting this house maybe once or twice in my life. Yesterday was the last of my father’s and Grandfather’s tray organized slides. Now we have the Carousel’s (some 50 of them or nearly 5200 slides). Some of the scans trigger memories for me. I remember seeing something or something and loosely associated with the what and where of the picture. Sometimes it takes a few minutes and I recognize the person or place. Sometimes the pictures just blow me away. 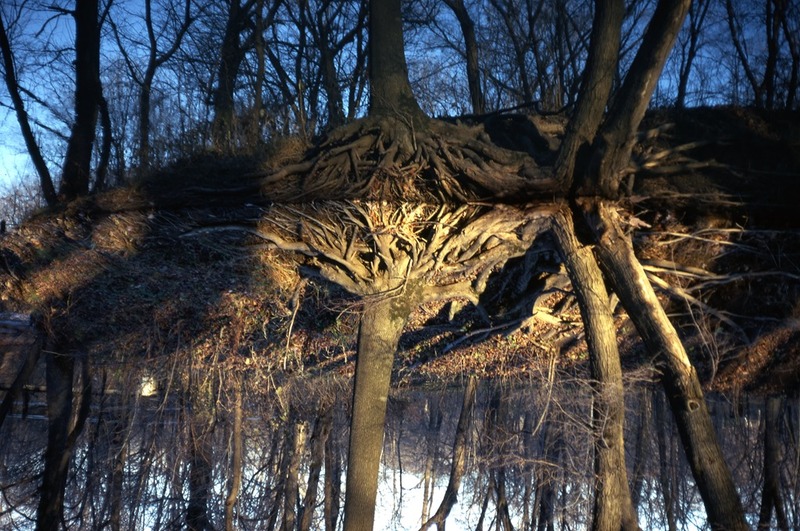 The picture of my father and I at the bend in the Wisconsin River still bothers me. I don’t recall that picture but I know the bend in the river. There are pictures there of people that haven’t walked this earth in a long time. Standing and smiling at the bend in th e river. My father. He was a Grand Man. This is one of those pictures. No idea where it was taken but I do recognize the person in the picture. The person who took the picture will say “poor composition not a good picture” but in the end it is a great picture. It captures the essence of the man. He was wearing a bolo with a golden something and with his wife. I love that smile dad. 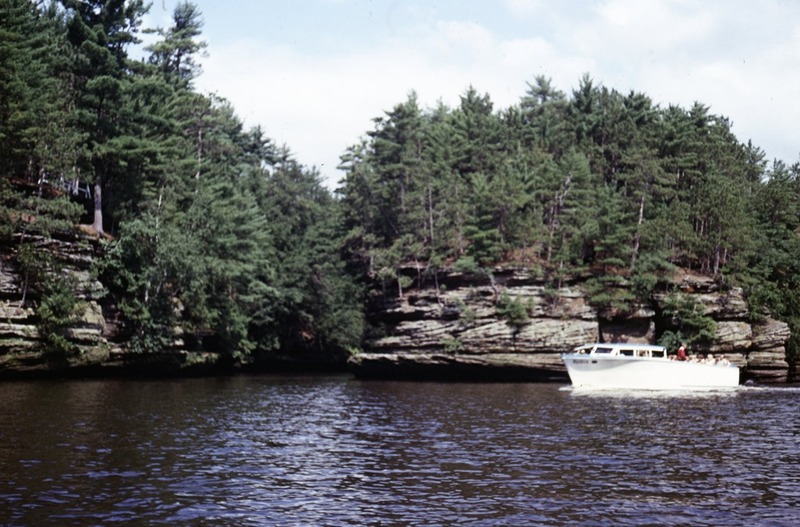 I think my grandfather’s best photos were taken around the Wisconsin River. 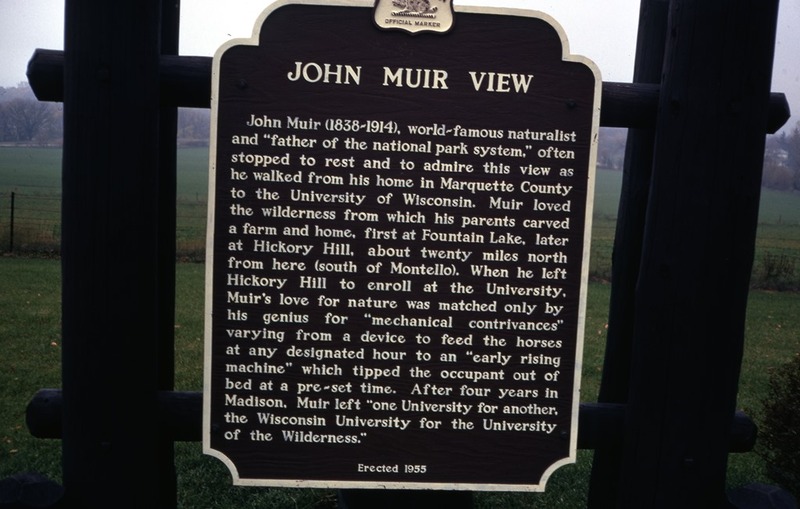 He loved the various locations near the Dells that brought out the scenic and rugged beauty of the place. I know he loved them because there are over 200 slides taken of this area more than anything else he ever took. 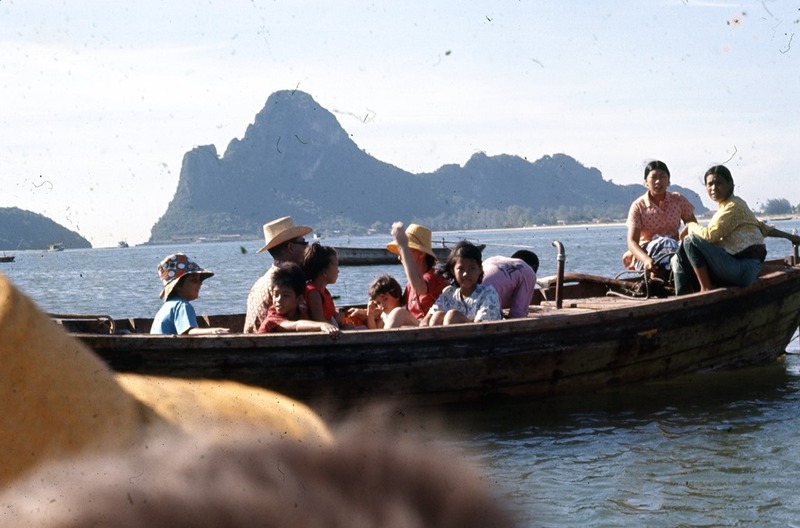 This one shows one of the old tourist boats that run along the river. I remember riding in the boats although I couldn’t tell you anything I saw. I love boats. So I loved riding on the boats and enjoying the river I guess without actually seeing any of the sites. 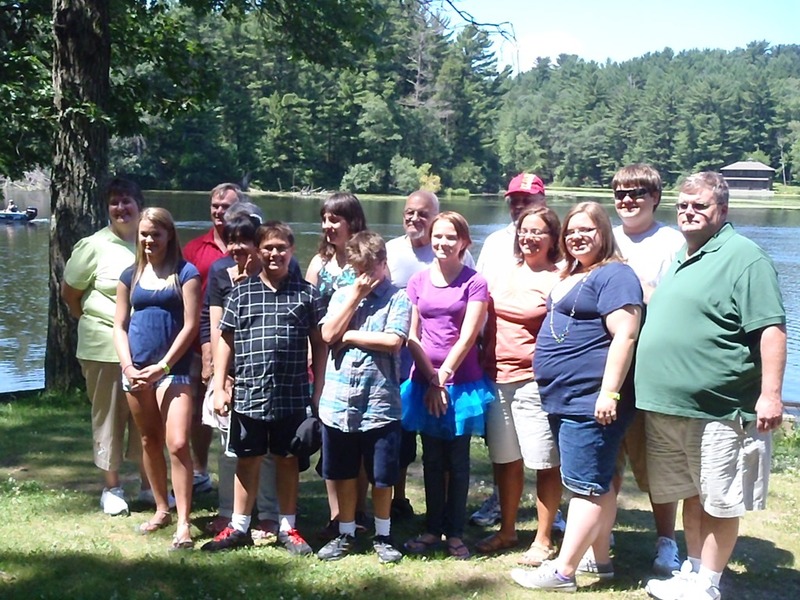 We took the entire family to the Dells in 2008/9. It was an amazing trip that we had an absolute blast going to the amusement park. Poor Barb had to study (working on her Masters) so she wasn’t able to come with us to the Dells. 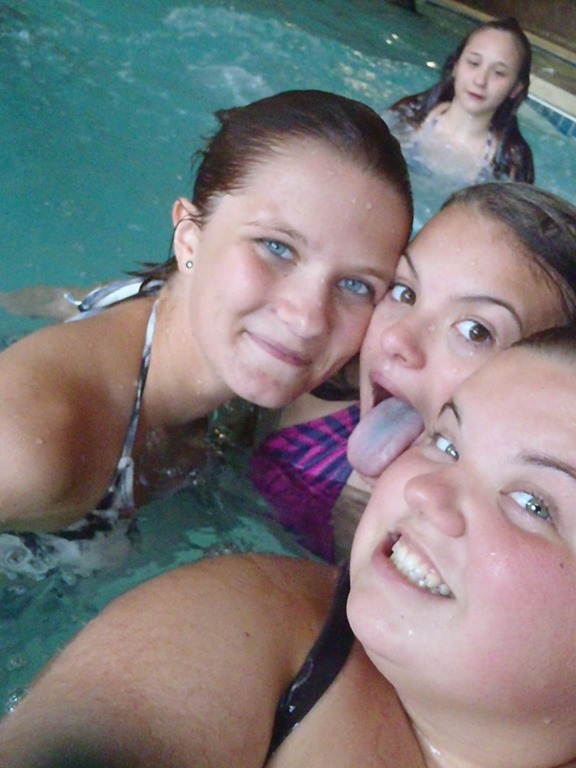 The first mistake I made at the Dells in 2009 was giving my nieces and my daughter the camera to use. I had just gotten the new Olympus TG-1 and was wanting to test out the water proof and rugged nature of the camera. The girls were willing to do that for me at no charge. 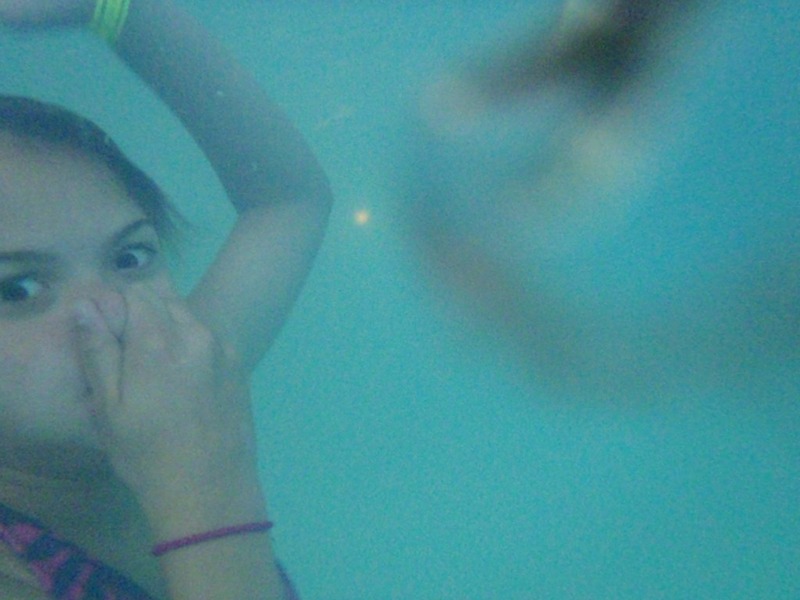 So I have a number of pictures of various nieces and my daughter holding their breath underwater. This is my niece Courtney Ooley swimming for Davy Jones locker at the dells indoor swimming facility. The last picture here is of the three nieces as they were hanging out at the poor. IT goes from right to left Megan Miser (my sister Lynne’s pride and joy) Courtney Ooley (my sister Barbara’s pride and joy) and finally Jacqueline (Jakki, Chick, Jaguar and or Quilly Bean Andersen) my pride and joy. They had a blast with the camera that day and took over 100 pictures of people in the water, people underwater, people jumping into the water and so on. Someday I am going to have to go through all of those pictures and figure out if I really need to store all of them. For the next two years after this picture was taken none of the three girls in the picture would let me photograph them without their tongues sticking out so this one is a keeper. The Dells trip was all about family. It was my Uncle Keith’s birthday and a chance for all the Johnston and Andersen Kids to get together. Plus all the spouses (except Barb) gathering together in Wisconsin Dells. Natural beauty and stopping by the road for an Historical Marker…. My grandfather Andersen took this picture in California in 1960. The slide sets from California are faded badly and I have not attempted to restore the pictures. We will later but for now this image comes to you from more than 50 years ago. 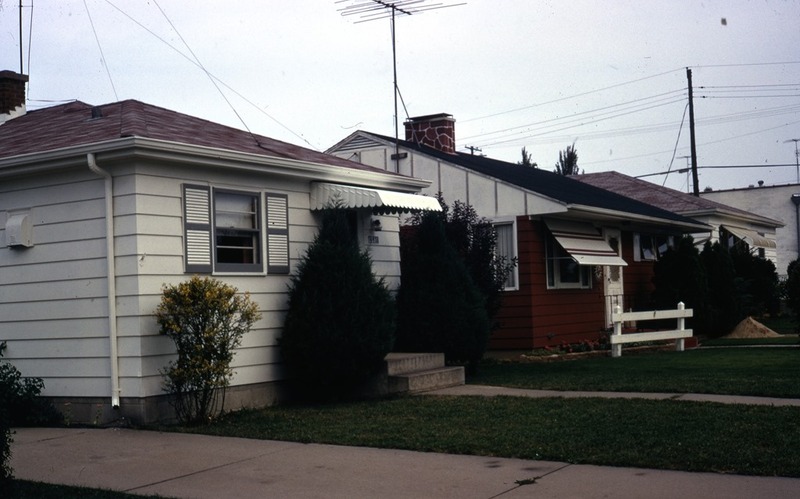 My Aunt Barbara and her husband (Bennet) lived in California in the late 1950’s and into the early 1960s. Neither one of them (Barbara or Bennet) would make it out of the 1960’s. 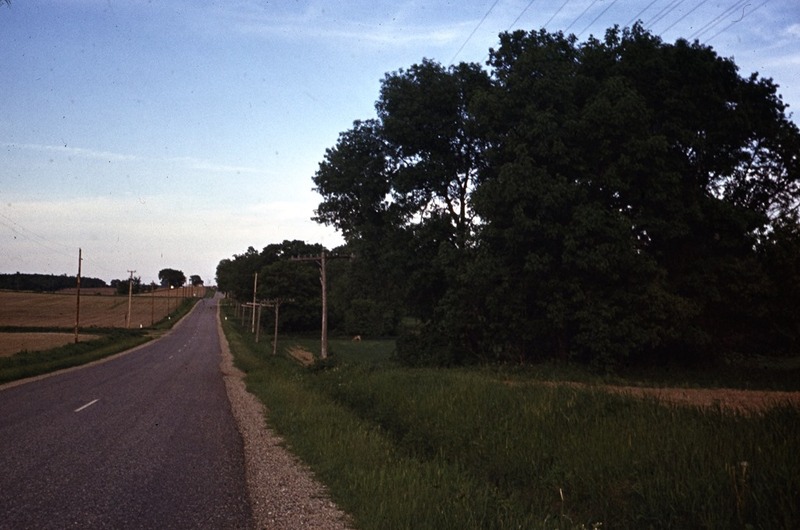 Photograph near Racine Wisconsin. My grandparents (dad’s mom and dad) moved from Wisconsin Dells to a town in Wisconsin near Racine called Sturtevant. They did so because my grandmother’s sister Mart lived in Racine at the time. They moved into a duplex in Sturtevant. That was the last home my grandfather lived in. Later Great Aunt Mart and Grandma moved to a condo actually in the city limits of Racine. I remember only that there was a Danish bakery around the corner (or so) from their house that made the best Cringle ever. Cringle is a Danish pastry and was actually one of the few deserts my father would eat. My grandfather Andersen used to love Chocolate Covered Cherries. I hope (but I don’t know for sure) that is where my love of Chocolate Covered Cherries comes from. It would be nice to have one thing from Grandpa Ole. I know his hatred of Tomatoes did not pass to me. 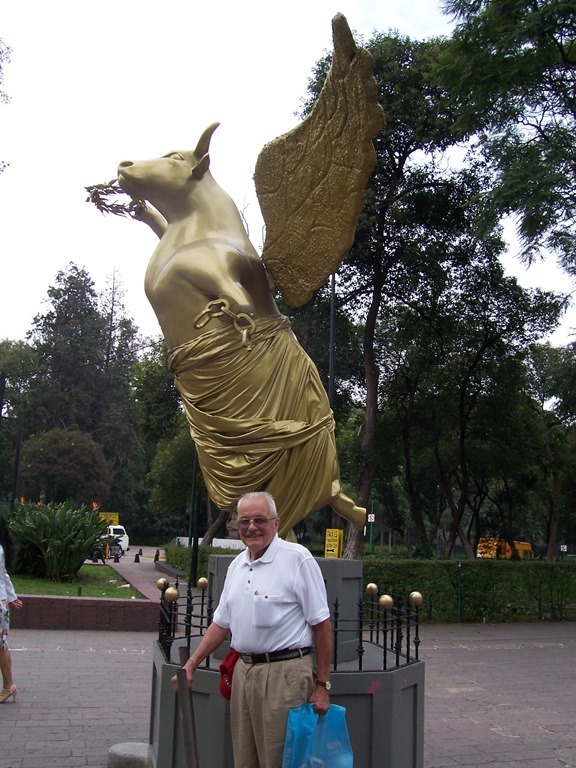 The two of them (my father and his father) loved to take pictures of historical markets. Dad used to stop the car and read them when I was little. He stopped the car still when Lynne and I got older but then he made us read them. I think so far in scanning (figure we are about 1/2 done with Grandpa’s slides and about a 1/4 done with dad’s) I have found 11 historical market pictures so far. My grandfather Andersen didn’t drive until later in life. So most of the trips he took were on the bus. He came to see us in Chicago, Iowa and Bloomington Indiana via the bus. I wish I remembered more. 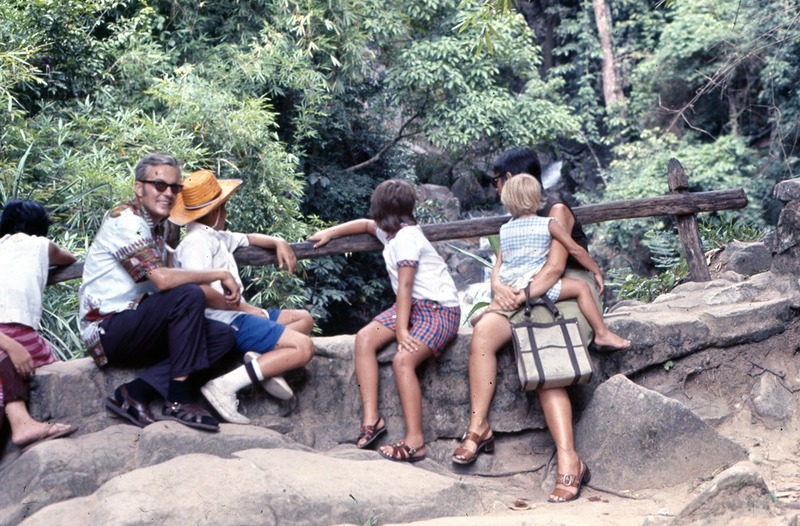 Most of the memories you are reading today came from my mother who reads this blog and sends me wonderful historical emails about who was in the pictures when I can’t remember.